Nursery themes are interesting, sometimes we choose a theme right off the bat and completely stick with it. Other times, a theme evolves over time. For me, Maxwell's nursery maintained a blue and green color palette throughout, but tiny details began to take shape as weeks went on. I call it "sheep-y and circus", and somehow those two things seem to work well in a playful way. When designing a nursery for your little one, choose items and colors you love, don't get overly influenced by the online design world. At the end of the day (and in the middle of the night and all sorts of random hours), this will be the place that you and baby will be, so fill it with what inspires you. This nursery actually used to be my home office, and cleaning that space was a huge task. But, once the home office was all cleaned out, I felt a great sense of accomplishment and desire to take on the nursery project. Wall color: “Nature’s Reflection” by Behr, Matte Finish. This wall color was the perfect shade of pale blue green that would anchor and inspire following decisions in the nursery. The large sheep painting was painted by me, the canvas is 3×3 feet which I found at Michael’s Craft Store for 67% off! The discounted canvas plus wood for framing it cost about $25, that’s really cheap for large high impact art. I had trouble with the facial expression on Mr. Sheep, he looked sad and high for many days, until i was able to re-paint a calm smile that I’m happy with. The green crib sheet was an extra from my toddler's bed, it pairs perfectly with the bright green grass on the painting, and it's always nice to save some money here and there by using items you have at home. The crib skirt was a $20 purchase from target, originally plain white. I used apple slices and paint to create polka dot prints all over it.. The cityscape mural helped tie many things together. First of all, it helped connect the themes by incorporating circus tents, playful pennants, and cute houses and buildings. It also unified all colors, and this was free for me to paint, as I have tons of green paint samples that I was able to use up. The other purpose of this little mural was to add visual height to this corner area. I kept feeling like something was missing, but now with the addition of the cityscape mural, things feel complete. I have seas to sail!”. Max is the main character in the children's book, "Where The Wild Things Are", and without going overboard with the whole “Where The Wild Things Are” thing, I did want to include just a tiny dose within his nursery. I framed these two illustrations, living right by his closet. I actually had more than one copy of the book, so I did rip these two pages out. It felt wrong, but I had to do it. The frames were frames we had laying around the house, originally gold. I gave them a quick white wash, and placed the illustrations inside. Free art, yes please. That blue jean jacket was mine when I was a toddler, I can’t wait for Maxwell to wear it.. The dresser was such a steal! I didn’t actually steal it, don’t worry. I found it (plus it’s original 1050’s bow-tie knobs) at a local peddler’s mall. I love the shape, the lines are minimal and masculine, and the knobs are cute as ever. I sanded the top down to it’s original wood color, and because I’m cheap, I used coconut oil to moisturize it opposed to buying a $6 can of stain or oil. It worked great. The dresser drawers are painted “Mossy Bench” by Behr (High Gloss finish), and the knobs are painted “Garden Swing” by Behr (Satin finish). The changing pad is from Ari’s nursery. The pad cover was from Land Of Nod, designed by Joy Cho (the boss-lady behind the “Oh Joy!” blog). She actually has a new nursery line out at target right now. Diaper basket from target. Wicker laundry basket, from elsewhere in my house (we have so many). These round wooden wall hooks are so cute, they were $5 each from Target. We have lot’s of scrap wood in the garage, so I used some to make a little wooden camera. The round lense is a lid to a toddler cup that we lost long ago. Baby clothes are so cute, and these hooks provide quick solutions for hanging out clothes for the next day. 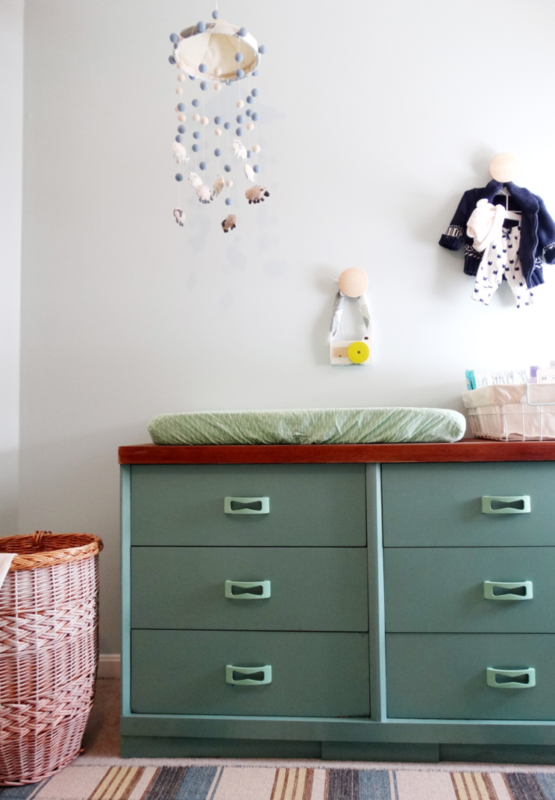 That nursery mobile is one of my tip top favorite things in the room. My other artist friend (yes, I have many), Jenny Bolhofner, handmade it for me. Follow her on Instagram right now. It is handcrafted with perfection and full of love. I saved a lot of money by doing a lot of these nursery projects myself, but I did splurge on window treatments. The “Fiddle Leaf” fabric on the window valance is designer fabric, but I bought it when I first found out I was pregnant, and planned on using it as the inspiration for the nursery despite the gender. One yard is $75. I also replaced super cheap blinds with a nicer wicker roman shade. The window is so small, it was only about $35 from Home Depot. The white crib was a gift from my mother in law. The rocker was another splurge item. In my opinion, a rocker is more important than any other item in the nursery, including the bed. I spent hours upon hours rocking Ari in his rocker. Mike did too. And he eventually broke it, yet we still use it? Anyway, I absolutely hate the brownish tan color of this rocker, but I love everything else about it. We bought it on cyber monday from overstock.com I always wanted a pottery barn rocker, but this one was in our budget. I hate when you have to stay in a budget, how annoying. If you’re wondering why I didn’t return it since I hated the color, it’s because I’m lazy. The plaid rug is also from Overstock, like the rocker, the colors on overstock screen are not true to the real rug colors, but for $99, I can work around it. Elementary art teacher and design enthusiast. Mom of two boys. It's all about circle time, great folks, expensive chocolate, and a well designed home.